Halloween Man Comics: The end of 2013 and the holiday season. It's New Years Eve and soon another year AND another holiday season will be in the past. 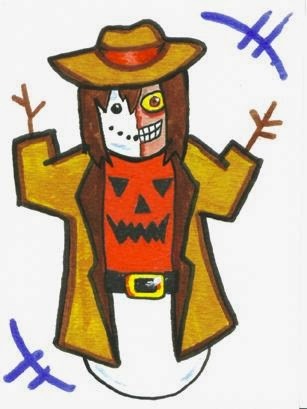 So I thought I'd take one last stab at a holiday themed blog. First on my mind, Bad Religion put out a Christmas album. Anyone who reads the comic knows that I love rock 'n' roll almost as much as I love monsters and comic books. 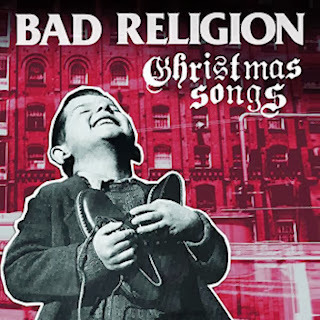 Bad Religion is one of my favorite bands, I even named an entire story arc after them. But I was still kind of dubious of the idea of a Christmas record. I mean, was it going to be a goofy set of ironic punk covers ala MeFirst and the GimmieGimmies? Still, hungry for holiday tunes more rockin' than the kind played at your local Target I downloaded the whole thing. It's actually pretty damn good. Instead of going for humor, the band play the songs fairly straight. When blasted through their sound, the songs take on an ominous and mysterious quality. This would be great music for a holiday themed horror movie. Although you'd be about a week late, I'd suggest checking this out if you're a punk rock fan. So while not directly holiday or New Years related, I did finally catch Gore Verbinski's Lone Ranger last night. Man, what a mixed bag! There is a point at the climax of the film, where they fire up the "William Tell Overture" and the Long Ranger and Tonto go after the bad guys. The resulting action sequence might be the best of 2013. It's old fashioned, rock 'em, sock 'em violence in the style of Indiana Jones. But more importantly, it has this gee-whiz charm that really suits the title character. If the entire movie had that tone, it would have been perfect. But sadly, the movie undercuts that tone at every point when 21st century snark. Some of it, I understand. I grew up watching re-runs of the Clayton Moore TV show. You couldn't recreate that and expect modern audiences to respond to it. 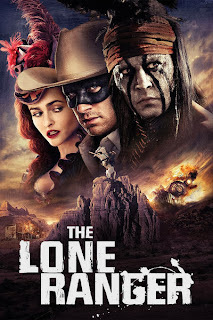 But what we're left with is a Lone Ranger who is a dork and a Tonto who is a manipulative whacko. Which might have been fine if they had overcome their differences and become this great crime fighting team. But we never see that evolve. So what we're left with is an unfinished character arc and disappointing "heroes." The movie has it's moments and some of them are great. Plus, it has style to burn. I just wish it had more heart. So I guess that is about it for me this year. 2014 is going to probably be the biggest year ever for "Halloween Man!" Happy Holidays and Happy New Year ya'll!